Most weekends I watch one or two films, so I decided to start documenting them and writing reviews. I’d also love feedback on what you thought of the film (if you’ve watched it) and any recommendations you might have of other films I could watch. This weekend we watched The Game and Talented Mr Ripley (we also watched Good Will Hunting too, well S did.. I slept through it). This film came out in 1997, so it’s a fairly old film. The title itself drew me in and since I base a film on the title or cover, that’s was a win straight away. The storyline to this film was intriguing and reeled me in from the start. I judge a good movie based on how many times I pick up my phone and since I didn’t touch my phone at all, I’d give The Game a 10/10. The film is about a banker from San Francisco (played by Michael Douglas) who is wealthy and a bit of a loner. He meets with his Brother who has been treated for mental illness and addiction and is given a unique Birthday present that the rest of the film is based around. I won’t tell you much more than that because the whole storyline is tied together, but I will say that I thought I had picked the ending early on but ended up being very wrong. You can read the full synopsis here on IMDB. The acting in this film is well done and I thought each actor brought talent to the film. It was easy to follow and didn't give too much away. As I said, considering I didn't pick up my phone once, I give this a 10/10. 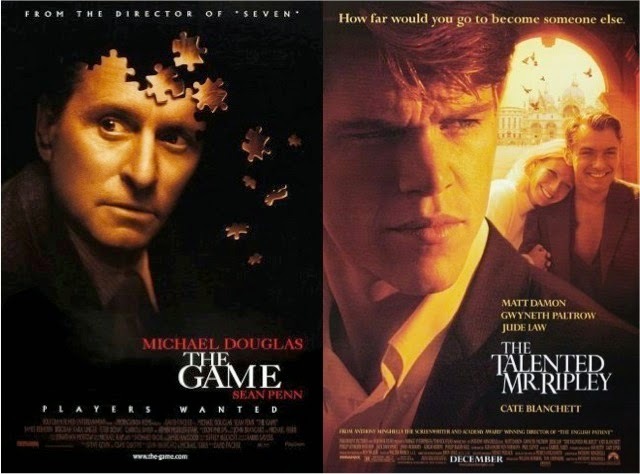 Another 90's film from 1999, Talented Mr Ripley was equally as intriguing as The Game, though didn't keep me as focused. I would say that was because after watching one film, I struggled to keep focus for a second. The film is about a young boy sent overseas to bring home a mans son. After failing, Ripley takes extreme measures and again, I won't give away any more of the plot but you can read more here. I wasn't able to pick the story line in this film either and found myself confused a few times when it came to figuring out what exactly was going on. It was a bit of a 'look down and you'll be confused' type film. I really liked the characters and found them to be loveable as they all had their own little quirks, good and bad. I give this film an 8/10 simply because it left me confused at some points. Have you watched any good films lately? What are your favourite genres? I LOVE The Talented Mr Ripley!! One of my favourite films. Gwyneth was beautiful in it and everyone in it acted their socks off. I haven't seen The Game but will have to check it out. I agree, she was really great in it - such a sweet character. I agree that Matt Damon's character was quite creepy. I liked him at first but as the movie went along he got stranger and stranger!